It's tough being different, and Taliyah's earth-shattering powers have always set her apart from the crowd. She’s a control mage who weaves the ground beneath her into a deadly weapon; when she sets her sights on a destination, the world itself shifts to get her there. When out of combat, Taliyah builds movement speed whenever traveling near walls. Passive: Taliyah gains increased movement speed when traversing worked ground. Active: Taliyah rips up the ground around her, firing a volley of five stone shards in a target direction while moving freely. Casting Threaded Volley converts the area into worked ground for a few minutes. Additional Threaded Volley casts over worked ground will yield just one rock projectile. Taliyah marks a target location. After a brief delay, the ground erupts, knocking up and damaging all enemies caught in the blast zone. Taliyah can recast Seismic Shove before it erupts to throw the victims in any targeted direction—even over walls. Taliyah scatters boulders onto the ground before her. Opponents who dash through the fractured earth take damage from an explosion. After a few seconds, any remaining rocks in the field erupt, dealing a second wave of damage. Taliyah briefly channels before summoning a massive wall of spiraling rock that tears through the Rift in a target direction. Taliyah can reactivate Weaver's Wall while channeling to ride atop the wall as it emerges. Taking damage or inputting a move command in any direction will cut her ride short. 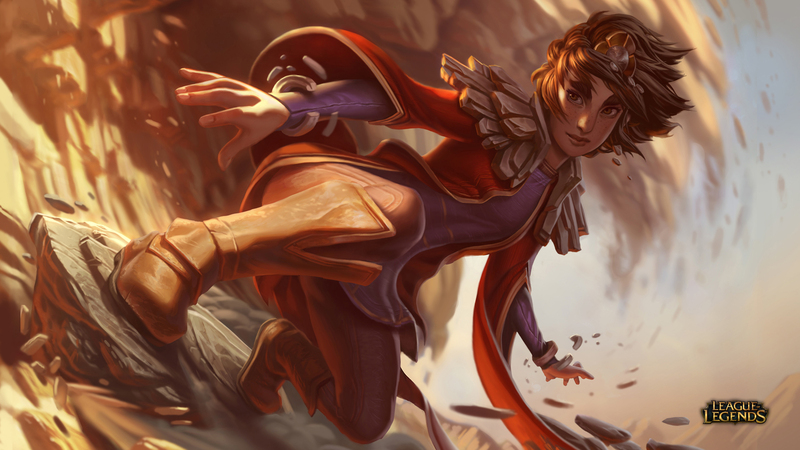 Taliyah is all about control—she dictates when and where she fights by setting up a gauntlet of traps for her lane opponent to navigate. To win trades, she can close off a section of a lane with Unraveled Earth and knock her opponent into the trap with a well-placed Seismic Shove. With her opponent exposed, a quick Threaded Volley will melt their health. Spamming Taliyah's abilities in lane will slowly diminish her dueling power, however, since ground which has been worked by Threaded Volley won't produce enough missiles to effectively stave off fast-approaching attackers. Experienced Taliyah players will work around this by carefully working strips of ground in a trail leading to their tower. She can use the exhausted pathways as an escape route when thirsty enemy junglers come barreling into her lane. If she's winning trades and dodging ganks, Taliyah excels at pushing waves into towers with her area of effect attacks. Once she's pushed her wave, her passive lets her bust out her rock-board and surf over to a friendly lane with tremor-inducing speed. She'll cruise alongside the map's walls, constantly gaining movement speed before blasting into a buddy's lane. Building an item like Luden's Echo gives Shurima's greatest (and only) surfer the means to dart around even faster, making her roams especially deadly. If you thought Taliyah's ganks were cataclysmic because of her passive, just wait til she hits level six. Weaver's Wall lets her roam to other lanes with ease, and the wall she rides in on can block off escape routes for the poor soul(s) she chooses to gank. Clever Taliyah players will use her ult to instantly apply pressure to far-flung objectives on the map. The enemy team’s taking Dragon? Excellent: just cruise over there and fill up the pit with Unraveled Earth, then blast the enemy jungler out of the fight using Seismic Shove. They're fighting Baron but taking lots of damage? Sweet: simply line up your ult to wall off the Baron pit with them in it, sealing the squishies in the oven to prepare a delicious feast for your teammates. Taliyah's strongest items allow her even greater control over her opponents' movement. When she dings a fleeing enemy with Threaded Volley while wielding Rylai's Crystal Scepter, the item's slow effect will make it that much easier for her to land her signature knockup-into-Unraveled Earth combo. Items that boost her low in-combat movement speed help the Stoneweaver quickly maneuver herself into the best spot to control any battle. In teamfights, Taliyah's area of effect abilities give her masterful power over her enemies' positioning. She might use Seismic Shove to hurl incoming juggernauts away from the fight, then slow the enemy team's exposed backline with carefully-planted Unraveled Earth. Taliyah's damage-less ult means that she won't bring major burst power to fights, but she can unearth her Weaver's Wall to split their team in half, giving Taliyah and her team the chance to gang up on exposed opponents before moving onto those left behind. Once a teamfight has ended, Taliyah is able to press her advantage with speed and grace. Her passive lets her rapidly cruise alongside jungle walls, catching up to escaping enemies or making her way to a far-flung tower. Once late-game hits and she drops a third point into her ultimate, its range increases enormously—she can steal an enemy blue buff after a fight, then Weaver's Wall to double-time it all the way to the enemy's Brambleback camp for the double-buff. Enemy frontliners will find themselves eating a relentless volley of rocks and bullets when running down Taliyah and Lucian. Plus, if the Purifier ever finds himself caught out, the Stoneweaver can ult to summon a rock wall near his location. Lucian's Relentless Pursuit lets him easily dash over the wall to safety. Lee Sin's powerful ganks combined with Taliyah's deadly roams make the mid-game very scary for their opponents, but they jive especially well in teamfights. When Lee uses Dragon's Rage to punt enemy laners into Taliyah's Unraveled Earth, the kicks and stones will probably break their bones. Taliyah ganks are extra devastating when the Keeper of the Hammer uses her Heroic Charge to pin enemies to the Stoneweaver's wall. In teamfights, Poppy can unleash her hammer to deport opponents to the far side of the wall, splitting teams even further. Taliyah is safe from nimble opponents so long as she's got earth between her and them, but she struggles against baddies who can dodge her rock barrage and slip past her defenses. She'll want to stay well out of the Master of Shadows' ult range, or she'll find herself marked for death. The Stoneweaver works best at the edges of teamfights, but Malphite has a way of bringing the battle straight to his targets. The Shard of Monolith's hard CC and engage are anathema to Taliyah—It's hard to weave stone when a living boulder knocks you ten feet into the air. If Taliyah can't catch a champ with her Seismic Shove, her damage output suffers. Enter LeBlanc, who's got enough tricks up her sleeve to keep Taliyah grounded. And also dead. Later this week we'll drop back in for some insights into Taliyah's development. Hyped to tear up the Rift as the Stoneweaver? Let us know in the comments.